Pierre-François Ouellette art contemporain in Toronto is pleased to present Kent Monkman: A Story of Canada. This exhibition focuses on residential schools and the removal of children from their families and communities on reservations in Canada. 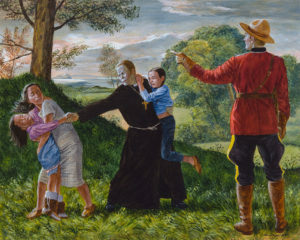 From early colonial days to the 1960s and beyond, missionaries and mounties facilitated the aggressive and traumatic separation of indigenous children from their rightful heritage and nationality. Five new paintings and a new photographic series titled Fate is a Cruel Mistress will be featured. Click here for installation views and works on display. This exhibition follows the opening of Shame and Prejudice: A Story of Resilience at the Art Museum of the University of Toronto. Click here for more information about Shame and Prejudice: A Story of Resilience at the Art Museum of the University of Toronto. Kent Monkman is a Canadian artist of Cree ancestry who works with a variety of mediums, including painting, film/video, performance, and installation. He has had solo exhibitions in numerous Canadian museums have including the Montreal Museum of Fine Art, the Museum of Contemporary Canadian Art in Toronto, the Winnipeg Art Gallery, and the Art Gallery of Hamilton. He has participated in various international group exhibitions including: The American West, at Compton Verney, in Warwickshire, England, Remember Humanity at Witte de With, Rotterdam, the 2010 Sydney Biennale, and Oh Canada!, MASS MOCA. The Musée d’art contemporain de Rochechouart in France presented his first solo exhibition in Europe in 2014. Kent has work for the last two years on Shame and Prejudice: A Story of Resilience a major touring exhibition which started at the Art Museum of the University of Toronto. Currently also on view at the Kitchener-Waterloo Art Gallery are the works of his Four Continents shown together for the first time. His work is represented in numerous public and private collections including the National Gallery of Canada, the Denver Art Museum, Musée d’art contemporain de Rochechouart, the Montreal Museum of Fine Arts, la Fondation de la Maison Rouge (Paris), the Musée d’art contemporain de Montreal, Rideau Hall, Leonard and Bina Ellen Art Gallery at Concordia University, the Glenbow Museum, the Art Gallery of Ontario, the Smithsonian’s National Museum of the American Indian, the Vancouver Art Gallery, Claridge, BMO Financial Group and the RBC Art Collection.